Life is full of surprise, you never know what will happen next. Now here in Zapals.com, we prepared Grab Bags for our dear new and old customers for your support all the time. Check now and see what surprises are waiting for you inside your Grab Bag. What is Zapals Grab Bag? Life is full of surprise. Zapals Grab Bag is a mystery wrapped gift package with lucky involved, you never know what surprises are waiting inside. What’s Inside My Grab Bag? Can I Pick the Products? Sorry, there is no possibility of products option. 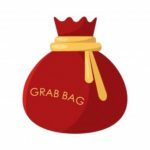 However, the value of your Grab Bag contents will worth far more than what you cost on it. What you’re gonna get is not only a surprise also a valued deal. Returns, replacement, and negative feedback are not allowed on these Grab Bag items. Use spaces to separate tags. Use single quotes (&apos;) for phrases.